Please confirm your vehicle information in the above compatibility section. For international customers, please confirm your vehicles year, make, model and VIN by sending us a message to ensure the fitment of the part since there may be a slight variations on international models. (ALL WARRANTIES MUST HAVE PROOF OF PURCHACE). 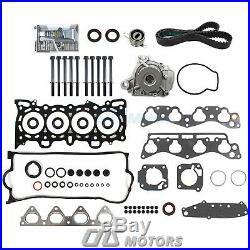 Head Gasket Set w/ Bolts Timing Belt Kit Water Pump. For 96-00 HONDA Civic & Del Sol 1.6L. 96 - 00 HONDA CIVIC HX 1.6L SOHC L4 16V V-TEC D16Y5. 96 - 00 HONDA CIVIC CX, DX, LX 1.6L SOHC L4 16V D16Y7. 96 - 00 HONDA CIVIC EX 1.6L V-TEC SOHC L4 16V D16Y8. 96 - 97 HONDA CIVIC DEL SOL S 1.6L SOHC L4 16V D16Y7. 96 - 97 HONDA CIVIC DEL SOL Si 1.6L V-TEC SOHC L4 16V D16Y8. 1 New Timing Belt (104 Round Teeth). 1 New Timing Belt Tensioner (Bearing Assembly). 1 New Water Pump w/ Seal. 1 Crankshaft Front Oil Seal. THE TEAM ARE HAPPY TO HELP. You need to have return authorization by contacting us prior to your return. The above limitations may not be applicable in your states. The procedure for a proper A/C Service must include. Clean A/C system with an approved flush, using an approved flushing method. (R141b and Dura Flush are approved). Proof of replaced filter drier or accumulator. Proof of replaced orifice tube or liquid line that contains orifice tube. Inspection/replacement of thermostatic expansion valve & clean inlet screen. Check for proper air flow through cooling fins of condenser & radiator. Condenser may need to be replaced. Please ask your technician for details. Check for proper fan clutch or electric fan operation. Check compressor clutch air gap before installation. Must add correct type & amount of refrigerant oil. After hose assemblies are attached, turn compressor shaft (not just the clutch pulley) a minimum of 10 times to clear oil from compressor (a spanner wrench may be required). Check compressor clutch electrical circuit for proper voltage. Evacuate entire A/C system for a minimum of 45 minutes if the temperature is above 80 degrees (60 minutes for dual air system or if temperature in below 80 degrees). 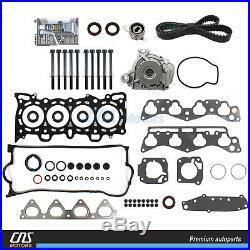 PART No : HS1400EBK160HB Application 96 - 00 HONDA CIVIC HX 1.6L SOHC L4 16V V-TEC D16Y5 96 - 00 HONDA CIVIC CX, DX, LX 1.6L SOHC L4 16V D16Y7 96 - 00 HONDA CIVIC EX 1.6L V-TEC SOHC L4 16V D16Y8 96 - 97 HONDA CIVIC DEL SOL S 1.6L SOHC L4 16V D16Y7 96 - 97 HONDA CIVIC DEL SOL Si 1.6L V-TEC SOHC L4 16V D16Y8 Component Multi-Layered Steel Head Gasket Valve Cover Gasket Intake Manifold Gasket Exhaust Manifold Gasket Valve Stem Seals Exhaust Pipe Gasket Cam Seal Grommets Rubber O-rings Spark Plug Seals Other Small Gaskets 1 New Timing Belt (104 Round Teeth) 1 New Timing Belt Tensioner (Bearing Assembly) 1 New Water Pump w/ Seal 1 Camshaft Seal 1 Crankshaft Front Oil Seal 10 Cylinder Head Bolts Note Multi-Layered Steel Head Gasket Viton Valve Stem Seal. The item "Head Gasket Set Bolts Timing Belt Kit Water Pump for 96-00 HONDA Civic Del Sol" is in sale since Tuesday, June 5, 2018. This item is in the category "eBay Motors\Parts & Accessories\Car & Truck Parts\Gaskets\Cyl. Head & Valve Cover Gasket". The seller is "cnsmotors" and is located in South El Monte, California.